Photo by Eurwyn Jones, no reproduction without permission. 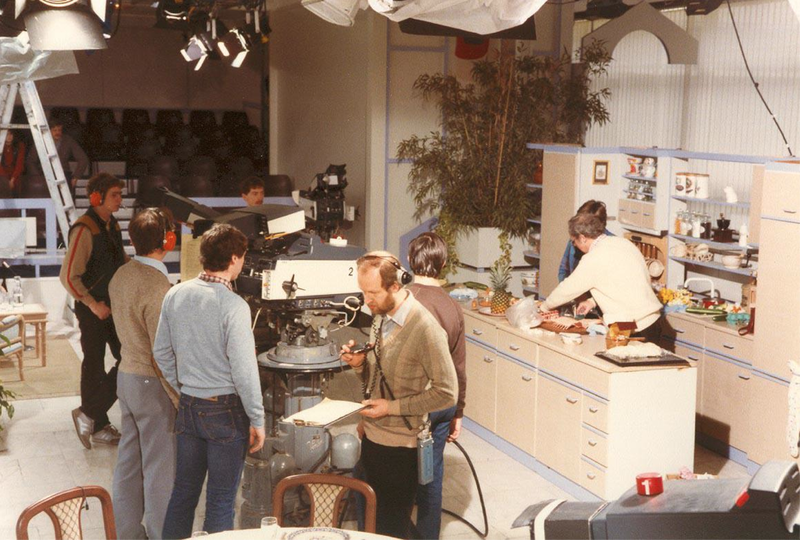 The photo is of a rehearsal of a Michael Smith cookery item for ‘Pebble Mill at One’ circa 1981. Michael is in the white jumper, behind the worktop. The cameraman on the left is probably Alan Duxbury, camera 2 might be Doug Smith, floor manger in the foreground in Eurwyn Jones. In the audience seating it could be producer, Pam Creed and producer and director, John Smith. Thanks to everyone who has identified the people in this photo. If you can identify anyone else, please leave a comment.